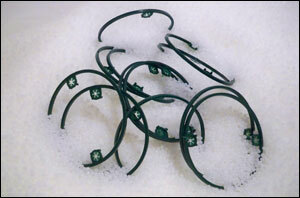 At KER Custom Molders Inc. we offer our very own Plant Ring & Plant Stake products. These items were designed and built by us and are manufactured solely by us. Our Plant Rings & Stakes offer a significant savings over comparable metal or bamboo products. And by selling directly to you we can cut out even more cost. 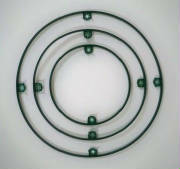 All Plant Ring products are made of 100% high density polyethylene. Our Plant Stakes are made of 100% polypropylene to offer greater rigidity and support. We sell directly to customers from small greenhouses to garden suppliers. We have customers as local as down the road and as far away as Louisiana and even to Canada! By having these products designed and manufactured by us and sold directly to you we create a great value for our customers. If you are interested in purchasing any of our products please fill out the form to the right and submit it. We will be sure to contact you as soon as possible with pricing, and any further information you might want. We will gladly send samples upon request. Plant Ring - 4" Plant Ring - 5" Plant Ring - 6" Plant Ring - 7" Plant Ring - 8" Plant Ring - 9" Plant Stake - 12" Plant Stake - 18"